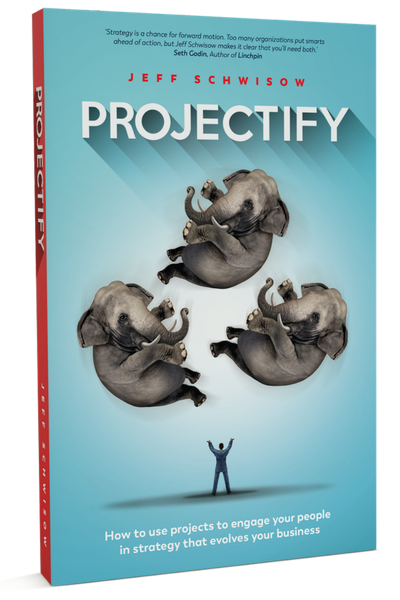 PROJECTIFY is a project book that isn’t about projects – at least not how to do them. It’s a book on strategy that talks little about strategic planning – at least not in particularly glowing terms. It’s a short book that is unapologetically written with depth and complexity – with layers of nuance and ideas that about how those layers need to inter-relate and connect if you’re to drive your business forward. It is not a pop song with a clever hook and foot-tapping back beat because – let’s face – creating meaningful, future-focused strategy doesn’t come from catchy slogans or quick fixes. It comes from bringing a lot of disparate parts together and getting them to move with similar rhythm and serve a set of shared goals and beliefs. It is a book that, at its core, is about building great businesses by creating truly exceptional workplaces. It’s founded on the premise that you can engage and motivate your people to shape the business that you aspire to be by giving them meaningful, future-focused work to be engaged in and a shared purpose to be motivated by. I makes the case that if you lead your teams by trusting, supporting and enabling them to do their best work, they will create an upward spiral of value for your customers, your shareholders and the culture that underpins it all. Many of these ideas are not new…their not my own…and they’re currently being practiced by some of the most successful businesses in the world. So, to paraphrase Sir Isaac Newton, if this book shines a light a little further down the path of the future of work, it is because my torch and I are perched squarely on the shoulders of some great thinkers, researchers and leaders that’ve come before me. What I know is that light will dim and flicker if it’s not magnified and refracted through the lenses of other like-minded leaders and thinkers. So, I hope that you’ll take the time to explore the book and the ideas it contains. If those ideas resonate with you – or even if they are contrary to your experience but strike you as intriguing – I hope you’ll discuss and debate their application in your world. If you do read the book in full and you find it worthy, I hope you’ll share it with a friend or colleague so they find their own value or perspectives in the ideas it contains. 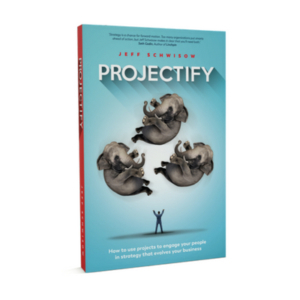 You can learn more about PROJECTIFY by heading over to my book page. There you’ll find links to the most popular online retailers if you want to buy a copy. Or, if you’re not quite convinced, you can ‘test drive the book’ by grabbing a free copy of the introduction and first chapter – The case for change. I hope that by reading it I’ll earn enough of your attention that you’ll want to go on to read more – to explore where the story might take you. Over the coming weeks and months, I’m going to work hard to unpack and explore some of the thinking that sits behind this work. Through the written word, of course, but also through sights and sound…discourse and emotion…discussion and debate. I hope you’ll join in on that conversation. If those conversations strike a chord – if we find that you believe some of the things that I believe – then perhaps that conversation can become a ripple – a ripple that helps to create a movement. A movement that helps to re-shape the future of work and the modern workplace. I look forward to seeing you on the journey.